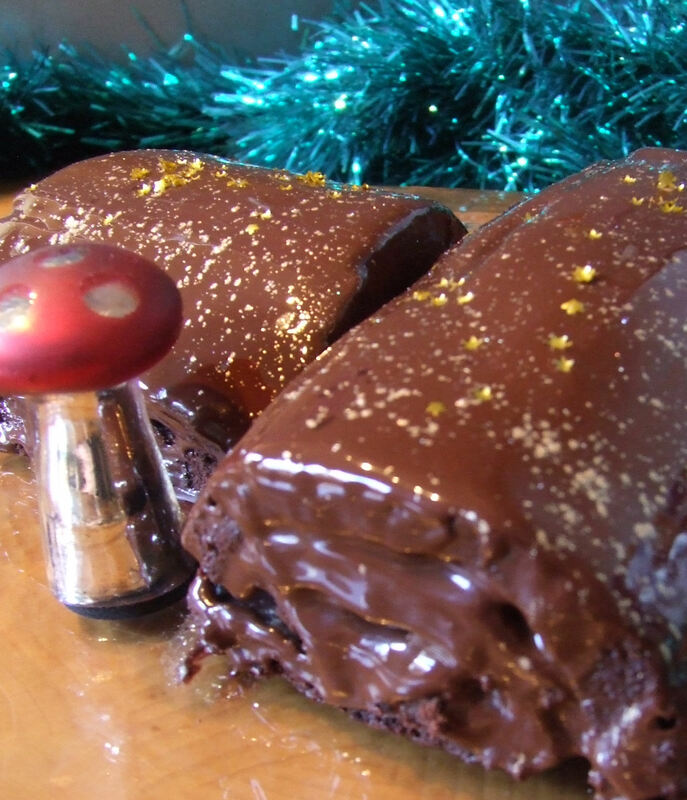 talkhealth > Blog > 2013/12 > To wish you a Merry Christmas – Gluten Free, low Lactose, chestnut and chocolate Yule log! To wish you a Merry Christmas – Gluten Free, low Lactose, chestnut and chocolate Yule log! Line two 30 x 19 cm sandwich trays with baking parchment. Beat the eggs and sugar till the mix is aerated, sieve the dry ingredients and add to the mix, fold with a metal spoon till incorporated. Add the mix to the tins and cook in the middle of an oven gas mark 6, 200 degree C for 10 minutes – watch them closely, as they are thin and at risk of burning. Before you remove the sponge from the oven open your tin of chestnut spread and be prepared to use it. Remove one sponge from the oven and working quickly remove the baking parchment and spread it with the chestnut spread. Roll into a log – it will crack a little but don’t worry, this will add to the overall log appearance. Keep the other sponge warm, then repeat with the process and cut the sponge at an angle to simulate a branch. Melt 1/3 of the chocolate in a basin over boiling water – remove and add the rest of the chocolate and cool the mix to temper it. (I am not sure this was wholly successful as it still looked a little dull on setting of the log.) Pour this slowly over the log to ensure it is covered, add some to each end of the log using a palette knife. Allow to set then serve! I wish all my readers a happy holidays and a calm gut New Year!